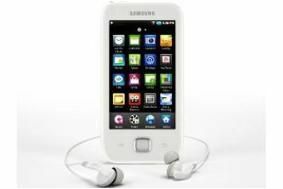 Samsung's new Galaxy Player portable takes aim at iPod Touch | What Hi-Fi? The company's great white hope – for it's only available in white at the time of writing – is the Samsing Galaxy Player; a mini version of the company's Galaxy Tab tablet. Available from today to pre-order on Amazon, it's due to be released on Friday 7th January with 8GB and 16GB models available at £150 and £180. The Android-powered PMP sports DLNA compatibility for wireless media sharing, a 3.2in colour display, an SD card slot for adding memory and a changeable battery. Claiming 30 hours of audio playback and 5 hours of video, the Galaxy Player supports MP3, WMA, AAC, WAV and FLAC audio files, plus mpeg4, DivX and Xvid video files, amongst others. We'll be reporting live from the Samsung press conference at CES 2011 where we're sure there will be more Galaxy-related news, alongside the latest TV and home cinema news from the company.